Arthritis is a complex condition involving inflammation of one or more joints. Arthritis is derived from the Greek word "arthro", meaning "joint", and "itis", meaning inflammation. There are many causes of arthritis in pets. In most cases, the arthritis is a progressive degenerative disease that worsens with age. Arthritis can be classified as primary arthritissuch as rheumatoid arthritis or secondary arthritis which occurs as a result of joint instability. "The most common type of secondary arthritis isosteoarthritis..."
Secondary arthritis is the most common form diagnosed in veterinary patients. The most common type of secondary arthritis isosteoarthritis (OA) which is also known asdegenerative joint disease (DJD). 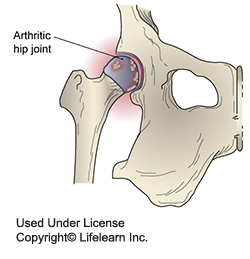 Some common causes of secondary arthritis include obesity, hip dysplasia, cranial cruciate ligament rupture, and so forth. Other causes include joint infection, often as the result of bites (septic arthritis), or traumatic injury such as a car accident. "Treatment will depend on the cause of arthritis." "Combining omega-3 fatty acids with glucosamine-chondroitin sulfate and NSAID therapy will help the majority of patients suffering from OA." Omega-3 fatty acid supplements, DHA and EPA, have been proven in humans to help with the discomfort of osteoarthritis. 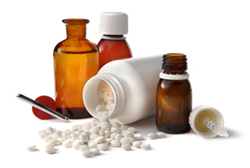 Nutraceuticals such as glucosamine and/or chondroitin, are also helpful in many cases. Talk with your veterinarian about these safe and simple to administer nutritional supplements and whether your pet could benefit from their use. Combining omega-3 fatty acids with glucosamine-chondroitin sulfate and NSAID therapy will help the majority of patients suffering from OA.